Home >> Generated from JAN's SOAR Information System on 4/26/2019 4:04:52 AM. 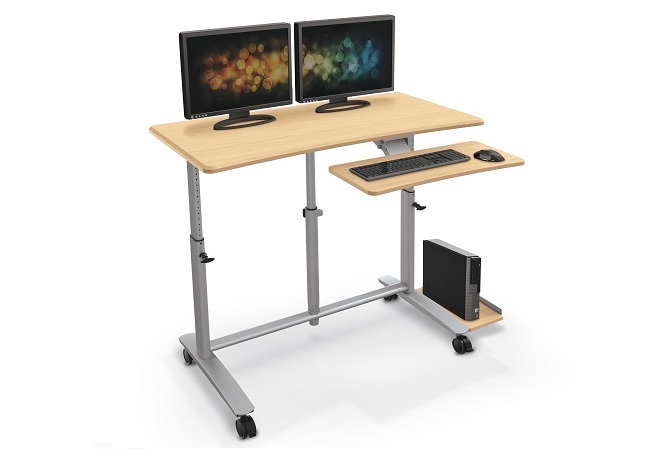 The Ergo E. Eazy Sit/Stand Workstation is the ultimate in ergonomic and adjustable workstations. Work surface adjusts pneumatically in height from 30.5" to 45.5", allowing use as a sit-down or stand-up workstation. Height adjustable keyboard platform (26.75"W x 11.8"D) swivels from side to side, and tilts for customized comfort. The shelf can be mounted to left or right side of workstation. Includes durable cable management tray beneath the back of the work surface. CPU holder measures 7.88"W x 15.75"D and mounts to either side of the desk. Includes 3" casters (two locking) for easily mobility.